Today, when you order "Flip LIVE", you'll instantly be emailed a Penguin Magic gift certificate. You can spend it on anything you like at Penguin, just like cash. Just complete your order as normal, and within seconds you'll get an email with your gift certificate. Flip LIVE (Penguin LIVE) Numerous ways to employ the humble envelope as a versatile and magical prop. SUPPORT LIVE MAGIC. DOWNLOAD THE FULL LECTURE TODAY. Flip is recognized worldwide for his creative contributions to magic, having published work stretching back over fifty years, and having received The Performing Fellowship Award from the Academy of Magical Arts for a lifetime of innovative magic. 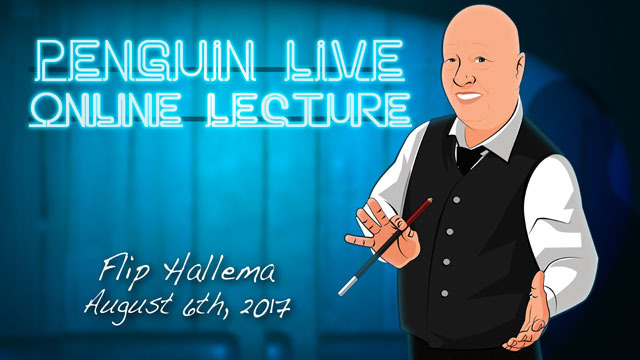 In this Penguin Live lecture, Flip flexes his creative muscles as he shows you numerous ways to employ the humble envelope as a versatile and magical prop. First, he folds an envelope into a tube and produces bottle of soda from it. Then, he changes a small piece of paper (with the word "Large" on it) into a large piece of paper (with the word "Small" on it). This transformation has many applications, and best of all, the envelope is completely examinable. Next, in a full routine, a large Queen of Hearts trapped in an envelope is torn in half and instantly restored. Then, it and its container are torn to bits and tossed into a second envelope which restores everything except the identifying corner, serving as a strange souvenir for the surprised spectator. And Flip's own Warp Wrap envelope causes paper currency to increase in value and coins to instantly vanish. Plus, you'll also learn a few fascinating card sleights, like the Swivel Glide used to make a signed card appear in an envelope... twice. There's so much more you can do with an envelope, including bring it to life, as you'll discover in this unusual lecture from one of the most creative minds in magic. Flip Hallema is best known worldwide for his extremely popular FL!P stick move where long objects like magic sticks, pencils, fans, etc. appear and disappear. This effect is now used by many magicians around the world. Flip developed a stage act giving him 1st prize for General Magic at the National Congress in Eindhoven in 1969. He later developed the Duplicate Magic act, a quiet song that he has shown in many countries. Flip Hallema was born the son of the architect Guido Hallema and An Faber. He learned the first tricks from his father at age nine. From age 12 Flip started inventing his own unique tricks. After the Academy, he worked as a graphic and industrial designer. In 1972, he decided to become a professional magician artist. In the eighties he lived for some time in Barcelona, Spain, where he and his second wife ran the oldest magic shop in Europe: El Rey de la Magia (1881). FL!P works as a magic artist (Wondertainer) both on the podium and with Parlor magic and close-up. FL!P is a member of the Magic Club of Central MKCN the Netherlands and the International Brotherhood of Magicians, a member of the Magic Zirkel von Deutschland and was from 2009 to 2015 chairman of the Dutch Magical Union (NMU). 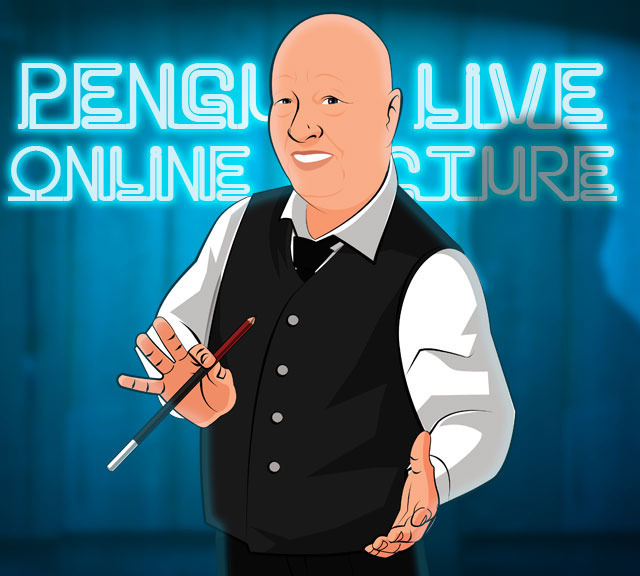 On Sunday, August 6th, anytime after 12:00pm Eastern, click the MyPenguinMagic area at the top of the Penguin site. You'll see the "learn" button appear next to this lecture. I had the privilege to meet Mr. Flip a few months ago. After just half an hour of his lecture I was deeply in love with his exploding creativity and his truly unique character. So I immediatly bought this live. Not only it is worth every single penny for the content that this Master offers to you, it' s worth much more for how much it will inspire you to create your original pieces. Thank you Mr. FLip!